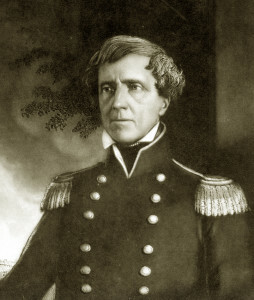 Kearny was a career army officer, who first saw service in the War of 1812. At the outbreak of the U.S.-Mexican War, he led an expedition from Fort Leavenworth, Kansas, to conquer New Mexico and California. He was able to talk the Mexican defenders of Santa Fe into giving up without a fight, and he marched into the New Mexico capital without firing a shot on August 18, 1846. He then advanced to California, which he helped secure for the United States.